Throughout my artistic career, I have worked in series. I take an idea, image or theme and explore the possibilities. I may work on a series for several years until I determine that I have nothing further to say on the subject. “Four and Twenty” came into being when, while out for a walk, I came across a flattened bird in the road. The form struck a cord within me, so I brought it into the studio to draw. My original plan was to produce twenty-four drawings, but I am now up to over fifty drawings of that bird. 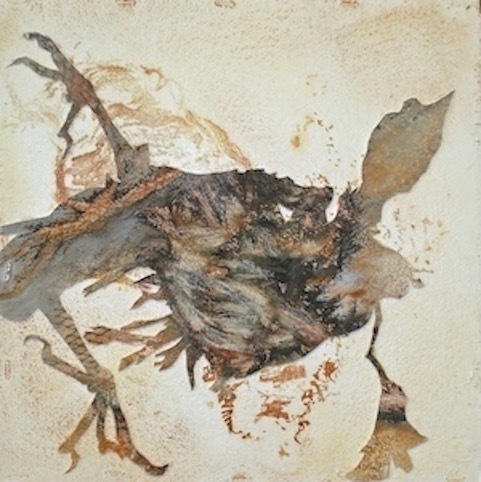 “Spirit Birds” grew out of my desire to make monotypes of the bird image. 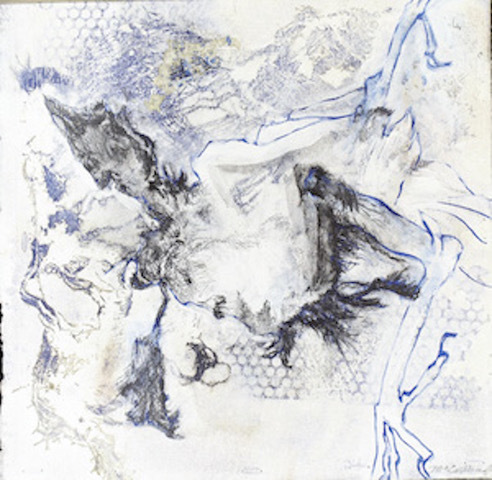 Using monotype afforded me the opportunity of spontaneous mark making and random play, thereby eliminating a degree of control and allowing me to redefine and rediscover the image. Some marks remain; some are obliterated; while other are traces of what had been beneath the surface, akin to visual archeology. 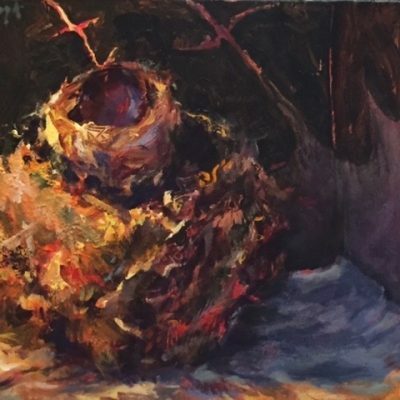 “Nests” has become the companion series to “Four and Twenty.” I started collecting bird’s nests when the wind blew one out of a tree in my backyard. 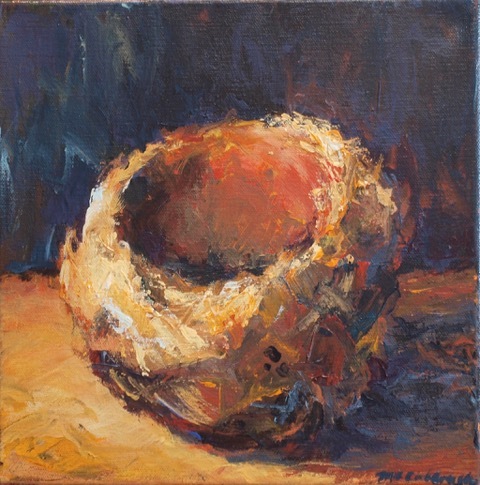 A nest represents a home or a container. It can be filled or empty. I am fascinated by the variety of shapes and materials used in construction of these nests. I work in a variety of mediums, including acrylics, monotype, and mixed media. I have lived in the south all my life; born on the island of Galveston, Texas; was educated in Texas; earned my degrees in art and art education from Texas Lutheran University, and the University of Houston, respectively. I taught art in the Houston Independent School District, Houston, Texas and Brandon Academy, Brandon, MS. I met and married a Mississippian, and moved to the state of Mississippi in the early 1970’s. As an active member of the Mississippi Art Colony since the 1980’s, I served as president and on the board of directors for over 11 years. I am a former charter member of the Mississippi Craftsmen’s Guild, a charter member of the National Museum of Women in the Arts, and an artist member of the Mississippi State Committee of the National Museum of Women in the Arts, I was awarded a grant from the Mississippi Arts Commission to work on the collaborative installation, entitled Working Without Annette. 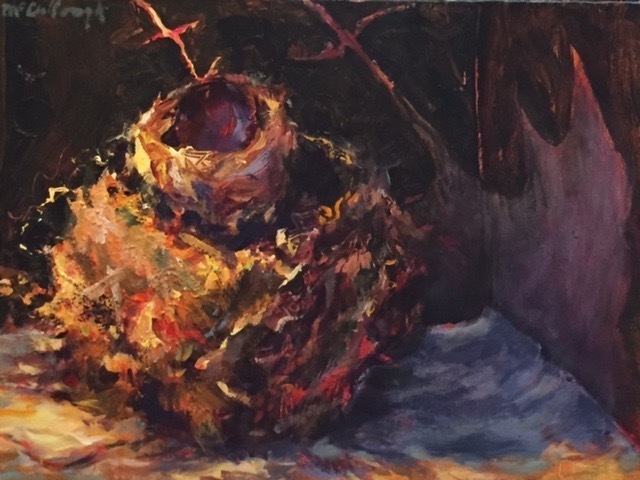 I have done graduate study at the University of Tennesse, Arrowmont School of Crafts, Gatlinburg, TN, as well as special studios at Hinds Community College and Tougaloo Art Colony. Over the years, my work has won numerous awards and has been included in regional, national and international exhibitions. It has been featured in invitational exhibitions such as Imaging the Interior, Women’s Sketchbook Journals,Yale Divinity Library, Yale University, New Haven, CT; Mississippi Art Colony 50th Anniversary Exhibition, Lauren Rogers Museum of Art, Laurel, MS; Monotypes 2004 Invitational Regional Exhibition, Covington, LA and ARTISTS BY ARTISTS, Mississippi Museum of Art, Jackson, MS to name a few. 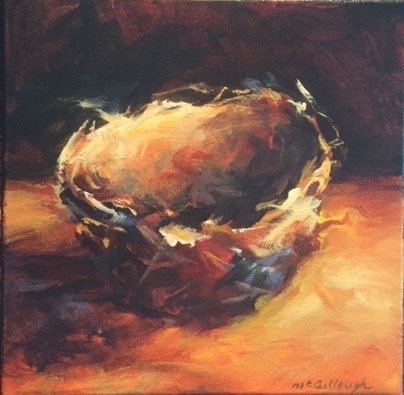 My paintings have been included in juried competitions as well: New Visions of Family, juried by Mirian Schapiro and Judith Ross, Muhlenberg College, Allentown, PA; After Her Own Image; Woman’s Work, Dorothy Gillespie, Juror, Winston-Salem, NC; Finalist, Thombai Arts Competition, Mississippi Museum of Art, Jackson, MS; and Drawing Finalist, International Art Competition, Glendale, CA. I have had the benefit to study under such noteworthy instructors as James Pinto, San Miguel de Allende, Mexico; Larry Jens Anderson, Atlanta College of Art; Edith Frohock, University of Alabama; Hugh Williams, University of Alabama; Jos. A. Smith, Pratt; Moe Brooker, Philadelphia School of Art & Moore College; Patrick McCay, Savanna School of Art & Design; Tom Francis, Atlanta College of Art; Jere Allen, University of Mississippi; and Michael Crespo, LSU. My art has been represented by The Attic Gallery, Vicksburg, MS; Gilded Pear Gallery, Gulfport, MS; Fischer Galleries, Jackson, MS; ARTworks, Laurel, MS; Southern Breeze Gallery, Jackson/Ridgeland, MS; Gallery Point Leflore, Greenwood, MS and Lagniappe, Greenville, MS; Almost Circle Gallery, Biloxi, MS; Negrotto’s Frame & Art, Gulfport, MS.